This is a common pumpout fitting, complete with beefy handle to allow the operator to keep the necessary seal of the hose tip on the discharge outlet. Break the seal, and the pump doesn't work. Once in awhile you come across a feature on a boat that looks pretty smart, but then you realize it doesn't work as intended. We just had that experience with the waste outlet on my friend's Selene 40. It is recessed into the side of the cabin, out of the way and elevated off the side deck. This keeps it from leaking when the sealant used around the fitting eventually dries out and cracks. If it was installed flush on a side deck, this might allow standing water to penetrate the fitting. Unfortunately, this recess created a different issue, which became obvious when we got the boat ready for winter haul out for storage. 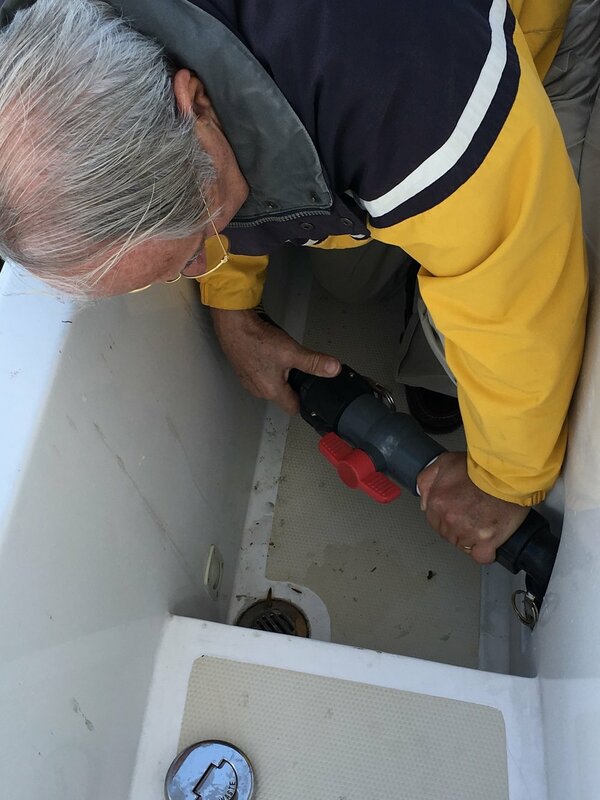 The pumpout hoses on many pumpout stations often has a built in handle to allow an operator to better control of the nozzle and put some leverage when holding the tip of the pumpout hose nozzle against the open discharge outlet on the boat. One must keep a bit of weight on the fitting to maintain the vacuum seal, or it doesn't pump, or leaks. The handle of this hose we attempted to use would not fit in the recessed access, as the handle hit the fiberglass when trying to hold it square against the outlet. No amount of twisting or side angle gave us the necessary contact of the hose fitting in the hole of the outlet. Nothing we did gave us the proper angle for a seal of the pumpout hose, as the handle would hit the side of the recessed fiberglass. No seal meant no vacuum, so it was impossible to empty the holding tank at this pumpout station. We could not get the pump to prime, and we had to give up. A couple of days later, we grabbed a mooring ball in Spa Creek and called the Annapolis Harbormaster's mobile pumpout boat to give it another shot. Thankfully, the hose setup on this pumpout boat was configured differently and we successfully pumped out the boat's holding tank. But this issue got the attention of the boat's owner, Howard Brooks, to perhaps consider moving this waste fitting to a more universally accessible location, such as flat on a step on the side deck, where an operator can easily push down vertically over the discharge outlet to get and maintain the required vacuum seal of the hose and the discharge outlet. The simpler design of the mobile pumpout nozzle allowed it to fit the tight space of the recess, and Howard was able to keep his weight on the nozzle to maintain the vacuum seal as the pump emptied the holding tank. This experience reminded me once again of the need for accessible systems. The Selene is now put to bed for the winter.